Honeywell announced the winner of its fifth annual student competition dedicated to the encouragement of design and innovation in the process industry. This year’s competition, which focused on the use of Honeywell’s dynamic process simulation technology, UniSim® Design, was won by Davide Bocciardo, a postgraduate student, from the University of Edinburgh, for his entry “Customising UniSim Design: membrane separation and its application to carbon capture”. Davide was presented with his award by Orhan Genis, vice president-sales, Honeywell Process Solutions EMEA, during the conference opening ceremony here where Honeywell is currently conducting its annual EMEA Users’ Group Conference. 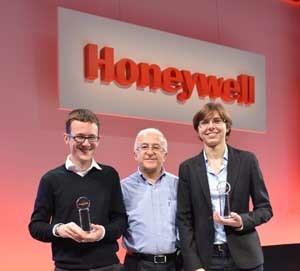 As thewinner of the 2012 competition, Davide will be attending the full three-day conference in Istanbul, November 13-15, and will have the opportunity to present his winning ideas to all of Honeywell’s EMEA customers and partners. In addition, Davide’s professor and project advisor, Stefano Brandani, will be able to choose a training course for himself or a colleague at the nearest Honeywell world-class automation college. Davide’s winning entry "Customising UniSim® Design: membrane separation and its application to carbon capture" focused on the creation of a customised user unit operation into UniSim® Design: Membrane_UoE. The innovative aspect of this investigation consists in the type of implementation carried out: Membrane_UoE is completely integrated into the simulation environment and it can be used to run process simulations similarly to the common unit operations available in the software. A multi-stage membrane process design applied to post-combustion carbon capture from a coal-fired power plant is presented. A detailed economic analysis is also carried out: as a result of this investigation, membrane technology shows promising results compared with the state-of-the-art solvent based capture. UniSim® Design Suite provides a process modeling solution that enables engineers to create steady-state and dynamic models for plant and control design, performance monitoring, troubleshooting, operational improvement, business planning and asset management. UniSim Design models may be leveraged into advanced training and optimization solutions provided by the UniSim® Operations and UniSim® Optimization suites. For further information on Honeywell’s annual student competition, please visit the Honeywell Student Engineers facebook page and for a free trial of UniSim Design Suite, visit the Honeywell Process website.